Explore smell's influence on taste and enjoy an enhanced dining experience with this innovative fork. A fun addition to dinner parties, this flavorful innovation brings a new twist to foodie fanaticism. Explore the sense of smell's role in taste and enjoy an enhanced dining experience with this innovative fork. While our taste buds can only recognize five primary tastes, our nose does the rest of the job, able to distinguish subtle flavors in their aromas. Twenty-four oil essences of basil, banana, ginger, and more can be dropped individually on the fork's absorbent scent pad. Once you lift the fork to eat your complementary foods, the scent hits the back of your throat just as the food is entering it, tricking your mind into tasting the combination. Click here to view all aromas included with the AromaFork™ . Visit the blog to see the UncommonGoods team give the AromaFork™a try in a blind taste test! 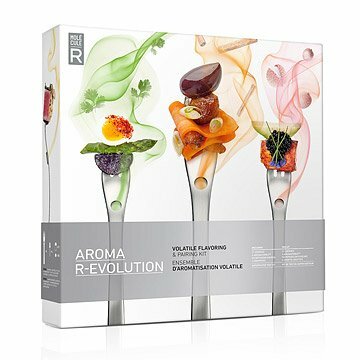 Make it a collection with our Molecular Gastronomy and Mixology Kits. Honestly, I didn't know what this was until I got it on my English Grammar Assessment, NoRedInk, and I decided to look it up. My boys and I bought one for the memes, but it turned out to be great. I gave it to my wife and she has enjoyed it even since. Good day, my lads. I can't understand the direction booklet. Are you suppose to eat food with it? The pictures shown do not look like any type of food I am familiar with. Very confused how to use this product. It was bought for me cause I have a problem tasting food. I really would love to try it but do not know how to use it. This was a Christmas gift for my son who lives in Texas. He indicated he followed all the directions and tried everything, but it doesn't work at all! Now we have to go through the hassle of a refund or replacement. I haven't personally used the item because it was a gift. however the recipient was very happy with it and said it is a lot of fun. Pretty cool gift! Original! Love it! Came nicely packaged! This product is SO much fun! Got this for my husband for our anniversary and did not regret it! We were having a little celebratory dinner with another couple and decided to break out the kit. First of all, the kit comes with four forks, which was absolutely perfect and means we were later able to give it a try with our kids as well. Second of all, it was all sooo much fun! I especially liked the 'trick your mind' type pairings where a food is combined with an unlikely aroma (chocolate mousse with wasabi aroma, anyone?). Even my husband, who was a bit skeptical at first, thought it was a lot of fun. Would definitely recommend for parties, get togethers and the likes!